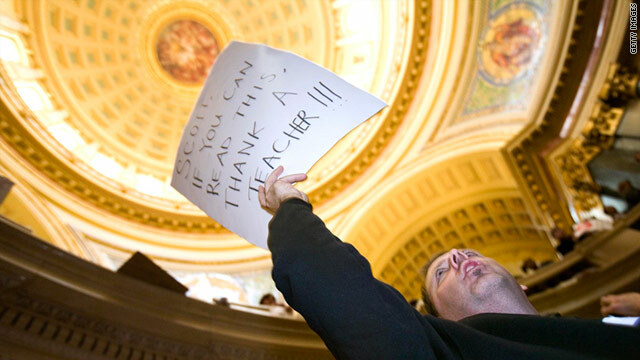 Teacher Terry Grogan of Milwaukee takes part in protest at Wisconsin State Capitol on February 16. Ravitch: How can we improve schools while cutting funding and demoralizing teachers? Editor's note: Diane Ravitch is a historian of education and the author of the best seller "The Death and Life of the Great American School System: How Testing and Choice Are Undermining Education." (CNN) -- Thousands of teachers, nurses, firefighters and other public sector workers have camped out at the Wisconsin Capitol, protesting Republican Gov. Scott Walker's efforts to reduce their take-home pay -- by increasing their contribution to their pension plans and health care benefits -- and restrict their collective bargaining rights. The uprising in Madison is symptomatic of a simmering rage among the nation's teachers. The much-publicized film "Waiting for 'Superman'" made the specious claim that "bad teachers" caused low student test scores. A Newsweek cover last year proposed that the key to saving American education was firing bad teachers. The Obama administration's Race to the Top program intensified the demonizing of teachers, because it encouraged states to evaluate teachers in relation to student scores. There are many reasons why students do well or poorly on tests, and teachers felt they were being unfairly blamed when students got low scores, while the crucial role of families and the students themselves was overlooked. Teachers' despair deepened last August when The Los Angeles Times rated 6,000 teachers in Los Angeles as effective or ineffective, based on their students' test scores, and posted these ratings online. Testing experts warn that such ratings are likely to be both inaccurate and unstable, but the Times stood by its analysis. Now conservative governors and mayors want to abolish teachers' right to due process, their seniority, and -- in some states -- their collective bargaining rights. Right-to-work states do not have higher scores than states with strong unions. Actually, the states with the highest performance on national tests are Massachusetts, Connecticut, New Jersey, Vermont, and New Hampshire, where teachers belong to unions that bargain collectively for their members. Unions actively lobby to increase education funding and reduce class size, so conservative governors who want to slash education spending feel the need to reduce their clout. This silences the best organized opposition to education cuts. There has recently been a national furor about school reform. One must wonder how it is possible to talk of improving schools while cutting funding, demoralizing teachers, cutting scholarships to college, and increasing class sizes. The real story in Madison is not just about unions trying to protect their members' hard-won rights. It is about teachers who are fed up with attacks on their profession. A large group of National Board Certified teachers -- teachers from many states who have passed rigorous examinations by an independent national board -- is organizing a march on Washington in July. The events in Madison are sure to multiply their numbers. As the attacks on teachers increase and as layoffs grow, there are likely to be more protests like the one that has mobilized teachers and their allies and immobilized the Wisconsin Legislature. The opinions expressed in this commentary are solely those of Diane Ravitch.